Please find listed below a selection of skills and services we offer. Dressed stone work using any type of stone. 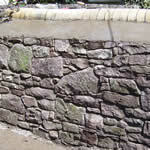 Roughly dressed stone which is laid in a mortar. Paving is done using a wide range of stone from flagstones to blocks to cobbles. We do a wide range of openings from Square Windows and Doorways to Bullseyes and arrow Slits as seen in our gallery. Traditional bricks are laid using a lime mortar. Embedded stone with the date of engraving and any other information carved into it. Can be built fromBrick, Rubble stone, Indian stone orBath stone. Renew mortar joints in masonry.